Some teams are just starting with the cameras, while others that bought them right away are far ahead and asking very interesting questions. Those 15 teams have been very secretive in revealing how they’ve used the data, but one team that has made serious progress — the Toronto Raptors — opened up the black box in a series of meetings this month with Grantland. That last bit — the ability to recognize individual player skills — is crucial for the juiciest bit of what the Raptors have accomplished: those clear circles that sort of follow the Toronto players around and have the same jersey numbers. 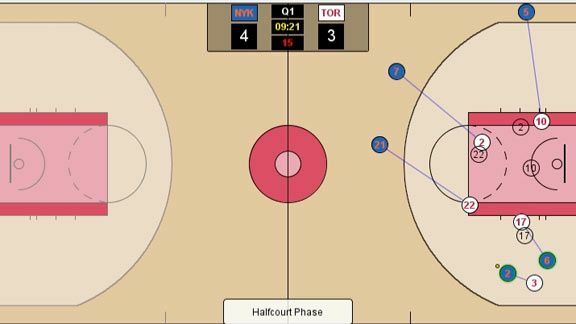 Those are ghost players, and they are doing what Toronto’s coaching staff and analytics team believe the players should have done on this play — and on every other Toronto play the cameras have recorded.3 The system has factored in Toronto’s actual scheme and the expected point value of every possession as play evolves.4 The team could use that expected value system to build an “ideal” NBA defense irrespective of the Toronto scheme, but doing so today would be pointless, since part of the team’s job is to sell a sometimes skeptical coaching staff on the value of all these new numbers and computer programs, says Alex Rucker, the Raptors’ director of analytics. Ghost DeRozan is in the middle of the paint to deter any pass to Chandler, while Ghost Landry Fields (no. 2) has zoned up between Anthony (no. 7) and Kidd (no. 5) on the weak side. Fields is actually closer to Kidd, in part because the program understands the higher expected value of a corner 3. That’s why Ghost Rudy Gay (no. 22) has moved a bit toward Fields’s man, even as the real versions of both players stick much more closely to their original assignments. Ghost DeRozan has left Kidd to slam into Chandler much earlier, and much higher on the floor, than Real DeRozan actually did. Since Anthony is dribbling toward the right side of the floor, the left side becomes the “weak” side, and it is the duty of the weakside defender in almost every NBA defense to help on the big man (Chandler) rolling to the paint. DeRozan does that here, but he does it too late; doing so earlier would stop Chandler sooner and allow both DeRozan and Jonas Valanciunas (no. 17) to retreat more easily to their original marks. The ghosts in Toronto’s ideal defense are almost always more aggressive helpers than real players, and that’s true across the league, according to the analytics team and Toronto’s coaching staff. Teams either haven’t realized they should be sending even more help toward the middle and the strong side, and sending that help sooner, or they haven’t fully convinced players to behave in this way. Attaching numbers to things like the placement of a defensive player represents a major advancement in sports statistics. Johnson is very good at chasing ball handlers beyond the 3-point line, but he didn’t have to go so far out here, since Hill dribbles away from the basket and is thus making himself a non-threat. West (no. 21) now has the ball, and with Johnson so far away, the ghost team has recognized a crisis the real players failed to see. The ghost of Valanciunas (no. 17) has abandoned Roy Hibbert (no. 55, on the left block) to run out at West, and Ghost Valanciunas can do that with confidence, because he knows Ghost Gay will leave Paul George (no. 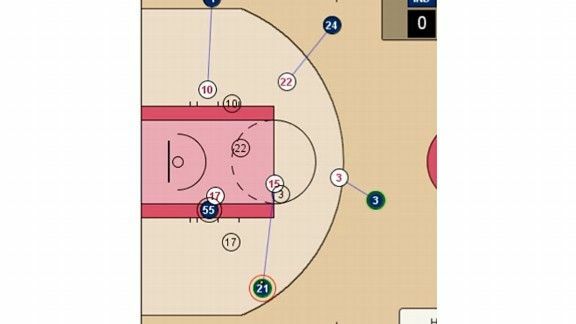 24) in order to crash down on Hibbert in the paint. But neither player moves, and West casually drains a midranger. Just a reminder: The movement of the ghosts is based mostly on the expected value of a possession, calculated multiple times per second, as that possession moves along; Ghost Gay is the rotator in part because the program understands that leaving George open is less damaging than DeRozan (no. 10) leaving a shooter in the corner. The ghosts are not moving randomly, or even just in the way the team’s coaches would like. 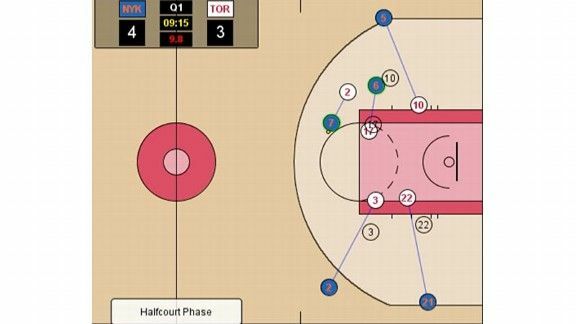 They are moving in a way the Raptors believe specific defensive players should move to thwart specific plays executed by specific offensive players with wildly different skill sets. Bryan Colangelo, the Raptors’ GM, had already set Toronto on the SportVU path before hiring Stefanski in the fall of 2011, and Stefanski credited Colangelo with pushing the Raptors in the right direction. An example: The analytics team is unanimous, and rather emphatic, that every team should shoot more 3s — including the Raptors and even the Rockets, who are on pace to break the NBA record for most 3-point attempts in a season. The coaches aren’t even close to being onboard with such a 3-happy philosophy yet. “To have guys who shoot 3s that can’t break that 35 percent break-even point, you have to really evaluate that,” Sterner says. Casey is obviously right that DeRozan is a bad 3-point shooter. But the analytics team argues that even sub–35 percent 3-point shooters should jack more 3s,8 and that coaches should probably spend more time turning below-average 3-point shooters into something close to average ones. The divide touches both on player development and on the degree to which the limitations of personnel should guide how a team plays. In very general terms, coaches tend to see personnel as paramount and limiting, while the analytics guys — from an upstairs office, of course — are more comfortable allowing players to stretch themselves toward more mathematically sound decisions. In other words: Paul Millsap is 30-of-109 career from 3-point range? Who cares! Let him shoot, and shift some of his practice time toward a shot that doesn’t conventionally fit his skill set and build. Valanciunas, of course, has been the chief focus of Toronto’s player development staff this season, and that has been another source of tension between the analytics team and the coaching staff. Valanciunas, like most rookies, misses rotations, overhelps, and commits other sins of positioning on defense. Coaches hate that stuff, and they’ve often nailed Valanciunas to the bench in crunch time in favor of Aaron Gray — a fundamentally sound player who lacks NBA athleticism. The numbers in large part disagree with that tactic, at least as it relates to Valanciunas’s defense. The Raptors’ defense has been better with Valanciunas on the floor.9 More importantly, the visualization data shows that Valanciunas is active and athletic enough to make up for all his defensive mistakes, Rucker and his team say. Casey said he hasn’t had deep discussions with the analytics team about Valanciunas, but Sterner has, and he agreed it’s sometimes a thorny issue of valuing culture over results. “You want your defense to be sound,” Sterner says. “Even though the production might be better, you still want [Valanciunas] doing the right thing. But let’s not exaggerate: This isn’t Moneyball, with people at each other’s throats and folks threatening to quit their jobs. It’s not even close to that, actually, and that’s in part because the SportVU data do something most smart NBA people have been doing for a long time: combine video (the “eye test”) with advanced statistics. Understanding sports has never been about one or the other; it’s about both, and the cameras represent the most advanced actualization of that marriage. The coaches in Toronto helped the analytics team build the ghost system, and the analytics team sends the coaching staff regular e-mails with advanced numbers on upcoming opponents — e-mails the coaches read. Coaches have also started using “points per possession” in conversations with players, and even tentatively passing along some tidbits from the cameras. The players think it’s all sort of geeky — Kyle Lowry cackled when I asked DeRozan about them — but teams are going to learn all sorts of new things from this data, and teams that exploit that knowledge on the court will gain some advantages. Finding synergy between coaches and stats guys is a big piece of snagging those advantages, and that’s going to be a tough process in some places. But the process has clear value. Ellis has been on fire since the All-Star break, and especially since the J.J. Redick trade. He’s picking his shots more carefully, leaning more on his (very good) passing skills around the basket, and going crazy in fourth quarters. He has also gradually added a bit of clever misdirection to his game, occasionally faking as if he’s going to participate in some common Milwaukee action, only to suddenly dart someplace else for the “real” play. 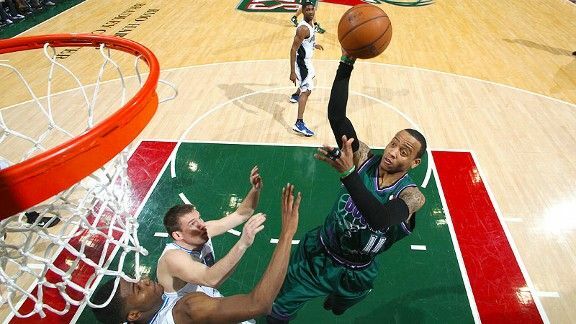 Ellis starts by pretending as if he and LARRY SANDERS! are going to jog over from the elbows to the left side of the floor in tandem for a quick-hitting pick-and-roll there — a classic Bucks set dating to John Salmons’s Milwaukee heyday, and probably earlier. But as the defense bites, Ellis veers back to the right side for a pick-and-pop with Ersan Ilyasova that completely wrong-foots the Wizards’ defense. Fun stuff. The Magic are bad, but they are surprisingly watchable for an NBA junkie curious about some intriguing and positionally ambiguous young parts. Tobias Harris has done well in extended minutes, combining a power game with a decent 3-point stroke, and Moe Harkless looks like he’s going to be a nice two-way slasher. Pairing that duo with Al Harrington in a funky and smallish front line, with Harrington playing center, makes for some enjoyable (and risky) ball, and replacing Harrington with a traditional center in Nikola Vucevic only ups the “interesting young guy” quotient. Give these guys a watch. Late in Miami’s blowout of Toronto on Sunday, Dwyane Wade drew a blocking foul while rising up for what would have been a monster highlight dunk and colliding with John Lucas III near the basket. The crowd went nuts, claiming Wade committed a charge, but large sections of the arena only had so-so views of a play that occurred in a jumble. Was Lucas in the restricted area? Was he moving? We all waited for a replay. None came. This is a pet peeve: In-arena staff should replay every controversial bang-bang call. Failing to do so is a disservice to fans. Nonchalant became my favorite English-language word the moment in my teenage years when I heard a baseball play-by-play guy refer to a second baseman “nonchalanting” the ball over to first base with a soft throw. So I grinned when Denver’s play-by-play guy, Chris Marlowe, got on Tayshaun Prince for “nonchalanting” a fast-break layup during Denver’s exciting Friday win over Memphis, leaving the ball on the front of the rim. Is this translatable to non-sports usage? Can someone “nonchalant” a job interview, or even a date? The bigger Morris hasn’t shown as much improvement, on either end, as the Suns likely hoped to see in season no. 2, and his post-up chances have been especially inefficient. Morris is shooting just 31 percent out of post-ups, per Synergy Sports, and giving him the ball there usually results in a tough, fading midrange jumper. Defenses understand that, and so don’t send much help toward Morris on the block, eliminating the possibility of a kick-out pass to an open shooter. Morris probably still projects as a role-playing stretch power forward, but in a lost season, it’s fine for Phoenix to experiment with him. This particular experiment hasn’t yielded useful results — yet. The play looks like a classic “flex” action, with Ridnour first setting a screen for Nikola Pekovic under the rim. Ninety percent of the time, he’d follow that up by taking Derrick Williams’s screen near the foul line and popping out for a jumper at the top of the key or a pick-and-roll. But Ridnour knows Golden State is expecting that, so he cuts off the usual pattern and curls around to the baseline for an open jumper. Fun, fun, fun. Let me be clear: I’ve really enjoyed watching Teague’s jump this season, especially in the last six weeks, and he’s going to be a very good player for whichever team signs him this summer. But he’s still finding the balance on defense between gambling for steals/watching the ball and marking his own guy. Teague’s steals are an important generator of turnovers and easy points for an Atlanta team that has ranked near the top of the league in forcing turnovers and doesn’t generate easy points via free throws. 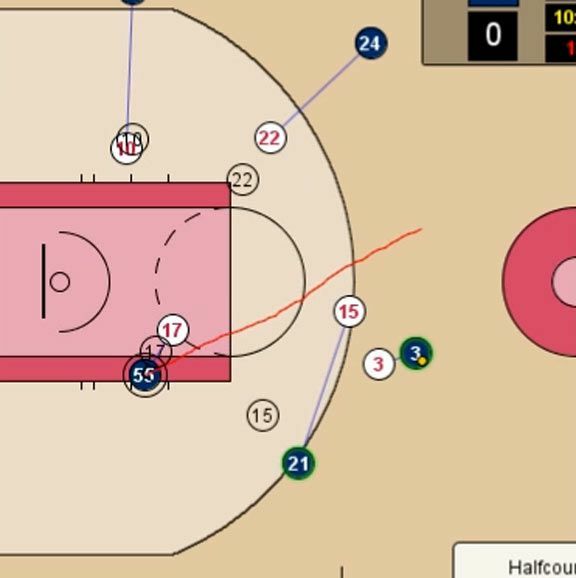 But smart teams know they can back-door Teague when he focuses too greedily on the ball. Teague will find that balance eventually; he’s a smart and very talented player. Walker has upped his scoring efficiency, a very encouraging sign in Charlotte. But his assist rate hasn’t increased at all over his rookie mark, and his passing game, especially out of the pick-and-roll, has sort of stalled out. Walker has a tendency to either pull up right away for an open jumper or drive hard into the lane, where he can get out of control and trap himself in tight spaces. The in-between game — the hesitation dribbles, the smart manipulation of space — still eludes him, as it does many young point guards. Walker is the victim of a lot of mitigating circumstances here. Charlotte has huge problems spacing the floor, especially when both Ben Gordon and Gerald Henderson are on the bench, and Walker is working with what has to be one of the very worst offensive front lines in NBA history. There isn’t even an average high-volume finishing threat among Bismack Biyombo, Brendan Haywood, Byron Mullens, Jeff Adrien, Tyrus Thomas, Josh McRoberts, and DeSagana Diop. Good luck racking up dimes when you’re dropping the ball off to those guys. Charlotte needs a big in the worst way. This article has been updated to correct information on a strategic action. The 15 teams, once again: New York, Orlando, Boston, Washington, Milwaukee, Toronto, Philadelphia, Cleveland, Dallas, Oklahoma City, Minnesota, Golden State, Houston, San Antonio, and Phoenix. There is much, much more, including a massive set of statistics on team tendencies I’ll address in a future piece. This includes a whopping 140,000 logged plays, about half of which are pick-and-rolls. In simple terms: The expected value of a possession when Kyle Korver is taking an open corner 3 is much higher than when Josh Smith is taking a contested 20-footer. Sterner, who began his NBA career as a video coordinator for the Magic 23 years ago, has a master’s degree in sports administration and computers, and was once chair of the NBA’s technology committee. Kopp hasn’t seen everything teams are doing, since teams are secretive even in dealing with STATS. Nori points out Toronto is shooting more 3s this season, and credits that in part to the influence of analytics. Paul Millsap is an example of a player who Rucker, Boyarsky, and Eric Khoury, the team’s analytics engineer, believe should have free rein to attempt 3s. The offense has actually been worse, to a much larger degree, per NBA.com.